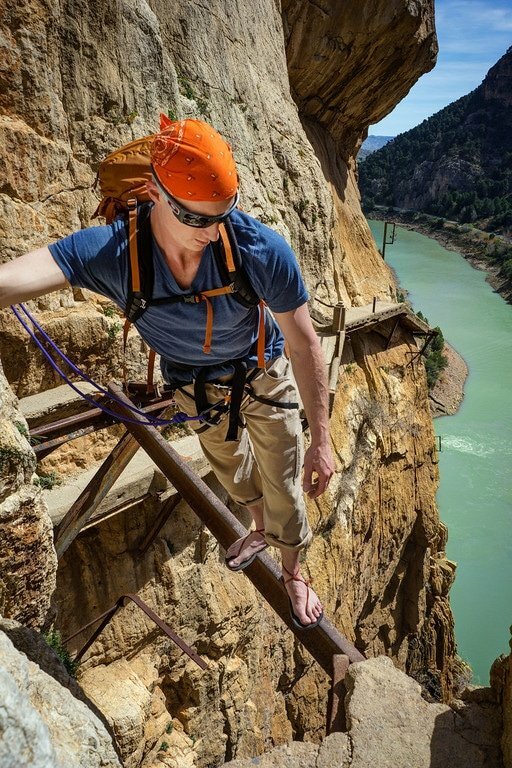 Balancing precariously on a rusty steel beam, I slowly hike across the Caminito del Rey trying not to glance down at the treacherous river hundreds of feet below me. 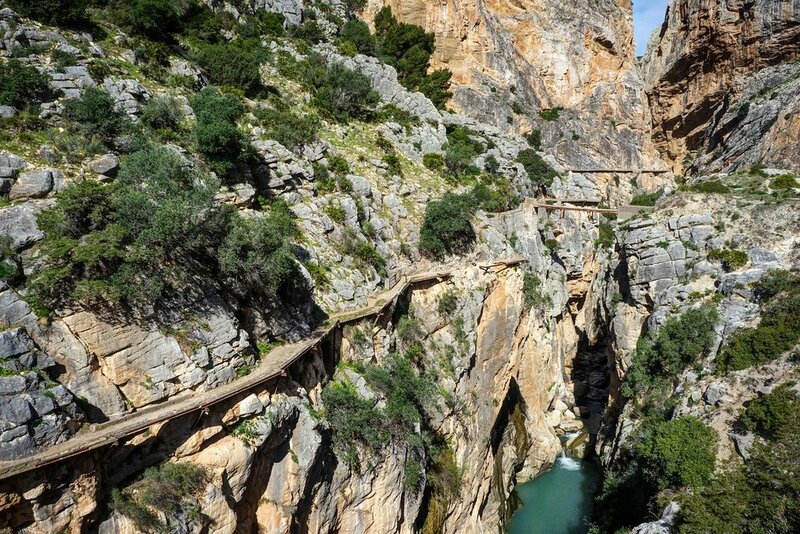 UPDATE: After my hike along the Caminito del Rey in 2014, the route has since been completely restored by the government, open and safe for all tourists to visit. 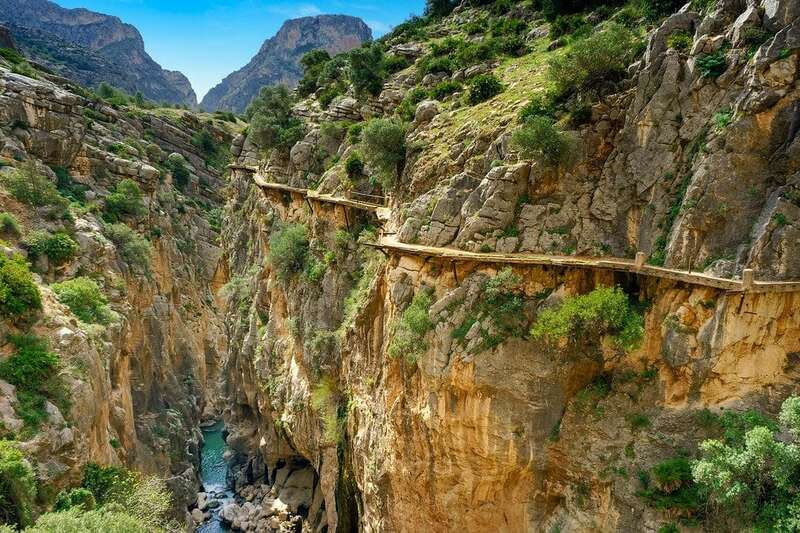 I’d traveled to this remote corner of Andalucia in the South of Spain to hike the Caminito del Rey. 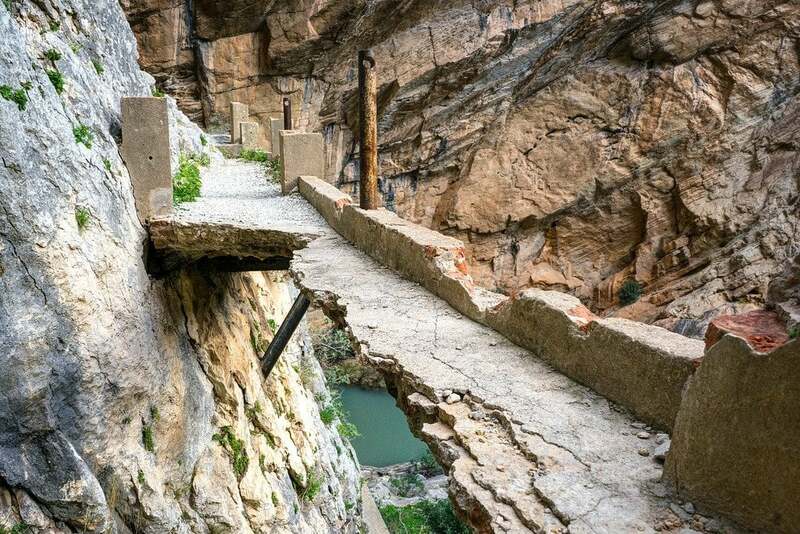 This path is famous around the world with rock climbers and adrenaline junkies due to its shocking state of disrepair. Just looking up at the hazardous path full of holes and missing sections sent a shiver of fear down my spine. Barely clinging to the vertical canyon walls it’s attached to — ready to crumble at any moment. 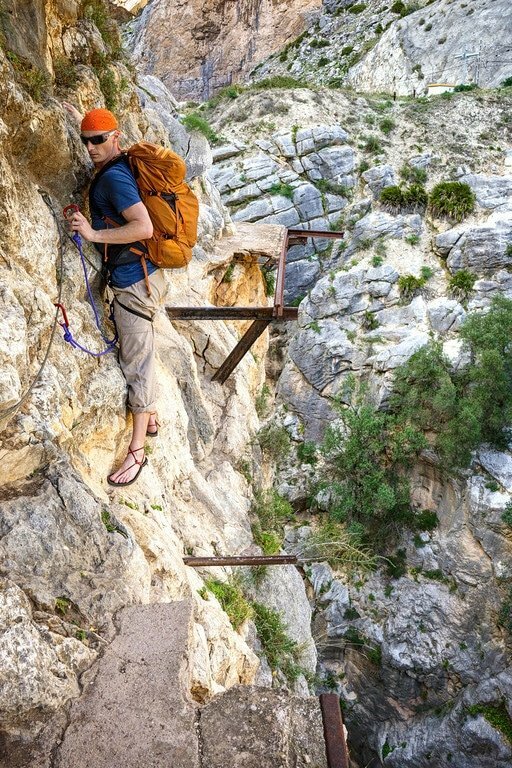 Known as Spain’s most dangerous path, or the most dangerous walkway in the world, the Caminito del Rey (The King’s Little Pathway) is over 100 years old and 100 meters (350 feet) high. 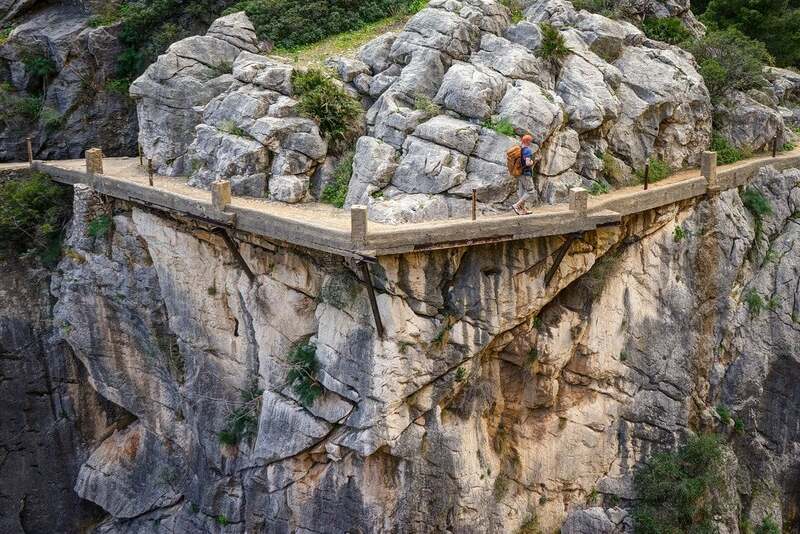 Walking the entire length of the 3 kilometer Caminito (sometimes called the Camino del Rey) has become an exclusive adventure sport for people crazy enough to attempt it. There are numerous sections where the concrete has collapsed, creating large open air gaps that are bridged by very narrow steel beams, themselves often rotting away. 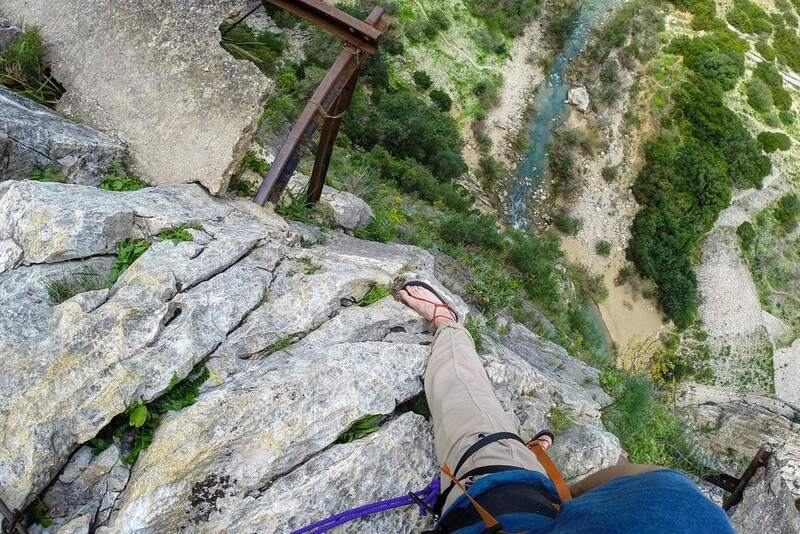 A via ferrata cable runs the length of the path though, allowing hikers to clip in with a harness. 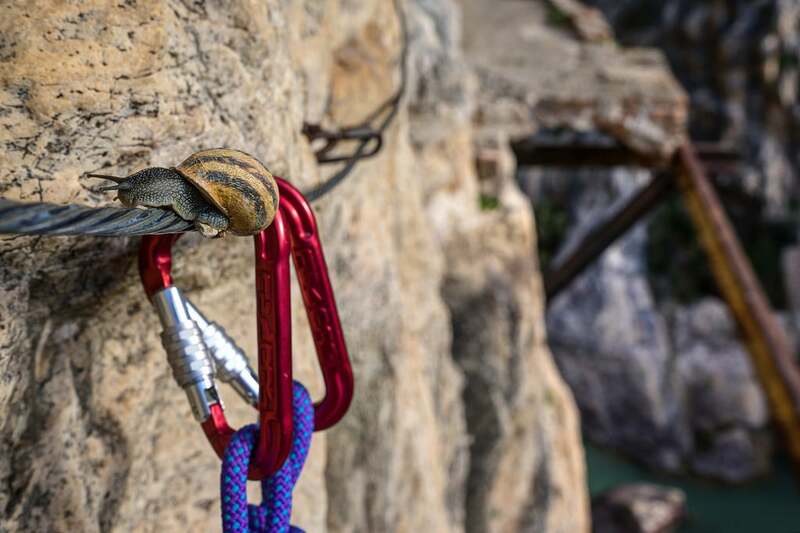 You need to bring your own gear or rent one from a climbing shop. Or you can make your own Swiss Seat (like I did) with some webbing, climbing a rope, and a few carabiners! However, the integrity of the safety cable running the length of the path is unknown, as it’s not officially maintained by anyone. So you must rely on it at your own risk. 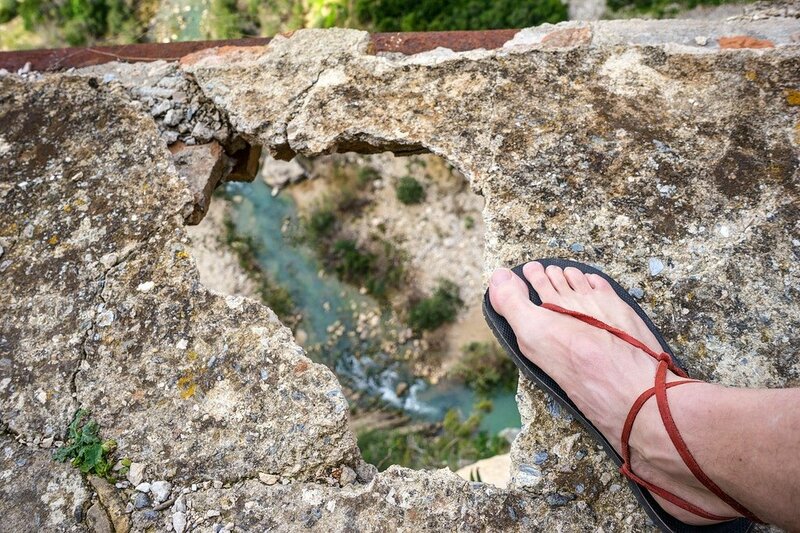 Armed with my trusty Luna Sandals made for trail running, and a backpack loaded with gear, I spent 4 days hiking the walkway over 8 times. Filming video with my GoPro camera along the way. 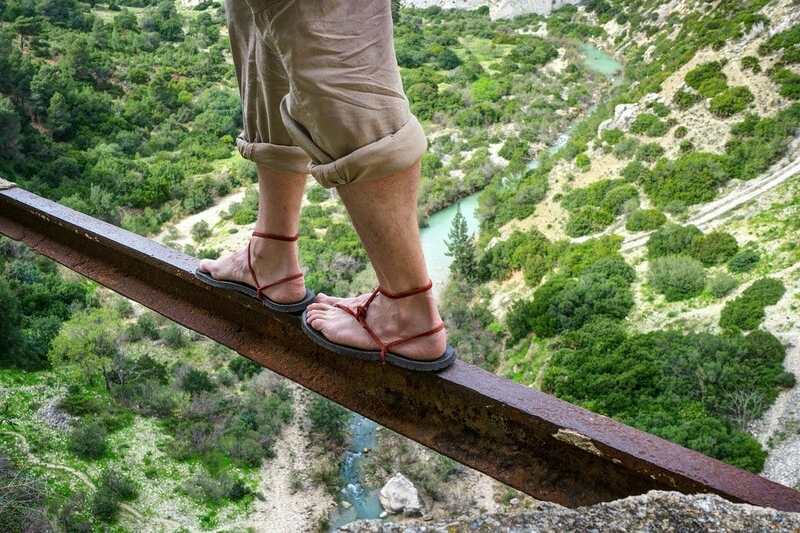 Would You Dare to Cross This Broken Section? On the hike itself, the wind whips through the narrow canyon, testing my nerves as I carefully place one foot in front of the other. Hoping my next step isn’t my last. I’m not the only one attempting to conquer my fears though, there are other adventurous hikers up here flirting with death. Sometimes we must pass each other, which can be complicated on a 1-meter wide path full of holes. In many places the entire path has completely fallen away, leaving just a three-inch wide steel beam to balance on. Other sections don’t even have beams — forcing you to cling to the face of the rock. 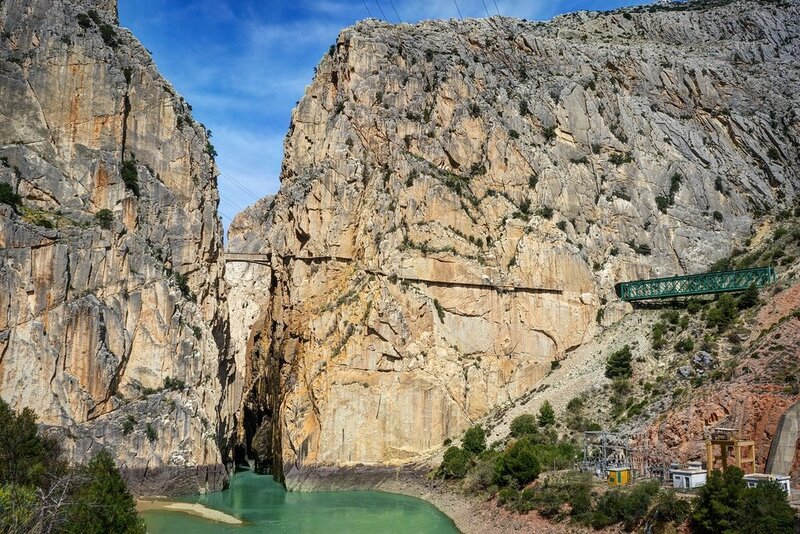 The Caminito del Rey is made up of two different sections. 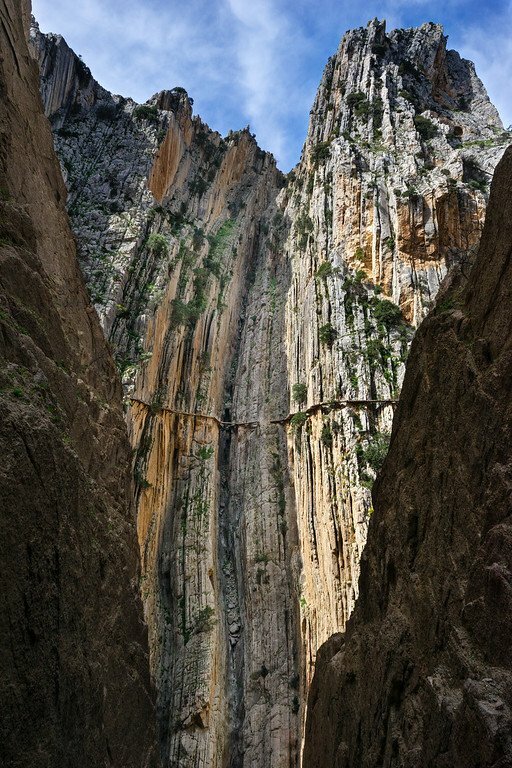 They each traverse a narrow area of the Gaitanes Gorge, with a stunning hidden valley located between them. “The Valley of the Orange” is completely surrounded by mountains, with orange trees growing near the Guadalhorce river as it flows through the middle. 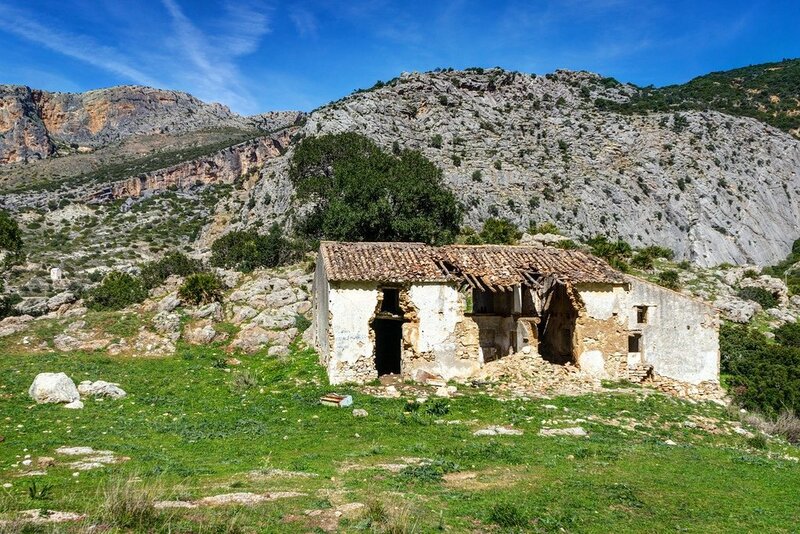 There’s even an old ruined house at the bottom. Less hikers attempt (or know about) the second part of the walkway. Much of it has no safety line, save for a few very sketchy sections that require some rock climbing skills to pass. After about 3 hours I finished this wild adventure at the far end of the valley. Luckily in one piece. 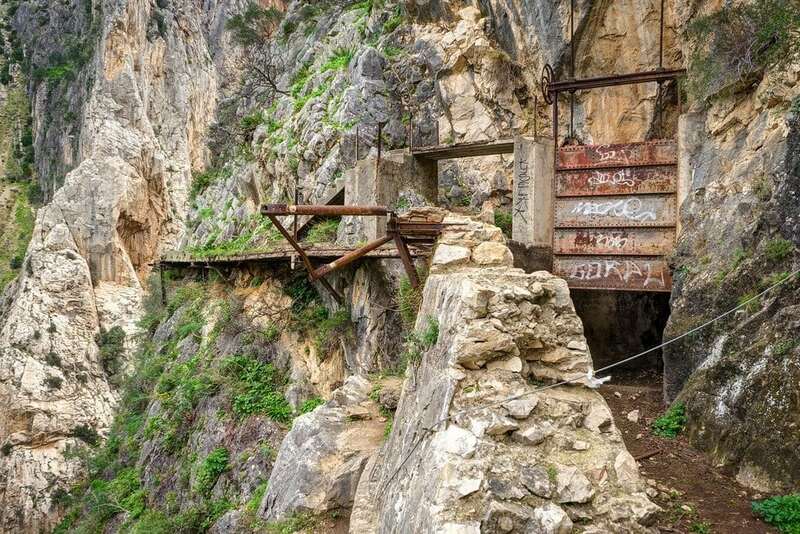 The walkway was completed in 1905 after 4 years of construction so workers could move materials back and forth between the two hydroelectric power plants at Chorro Falls and Gaitanejo Falls on either end of the canyon. A water canal also weaves its way through tunnels in the mountains. The suspended catwalk allowed easy access to this canal for inspections and maintenance work, controlling the flow of water when necessary using a series of steel doors lowered into the canal with gears. Spanish King Alfonso XIII inaugurated the pathway in 1921, which is why it’s now called “The King’s Little Pathway”. The King himself walked the length of it to marvel at the beautiful & scenic landscape. 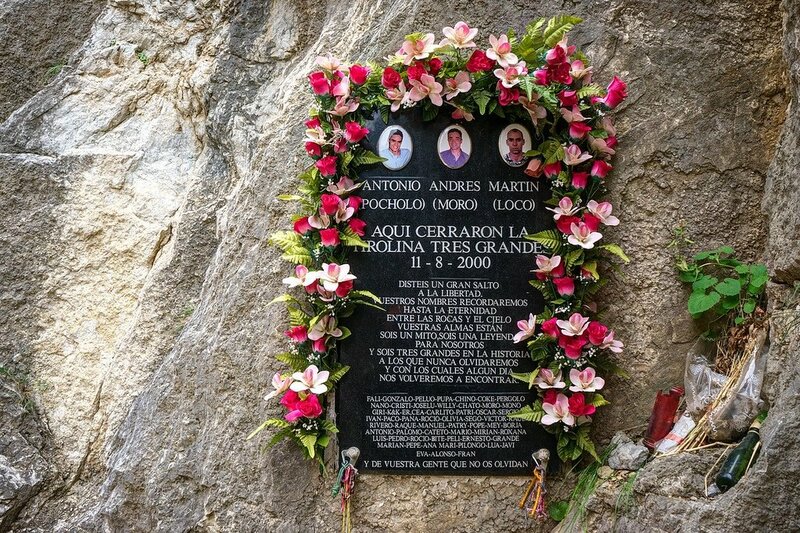 There have been at least 5 deaths on the Caminito del Rey, the most recent few occurring in 2000, and many more accidents over the years. 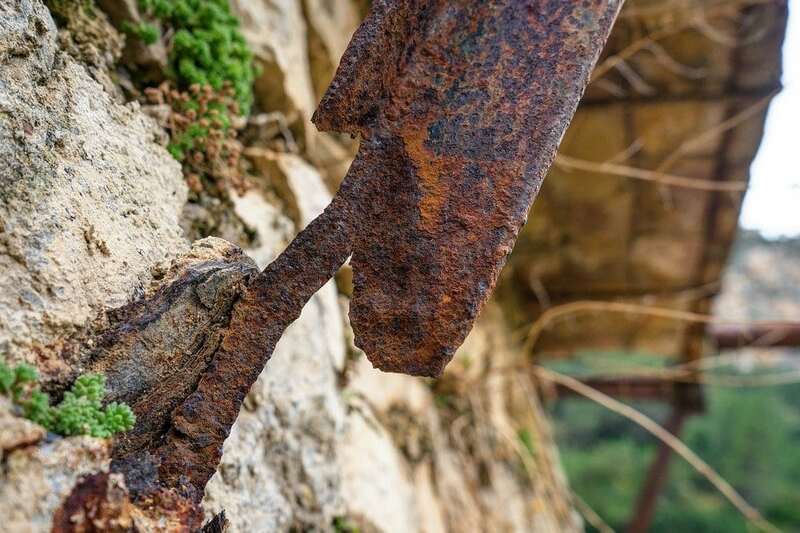 The path hasn’t been maintained since the 1920’s — rust eats away at many of the metal support beams. Large gaping holes in the concrete are common. 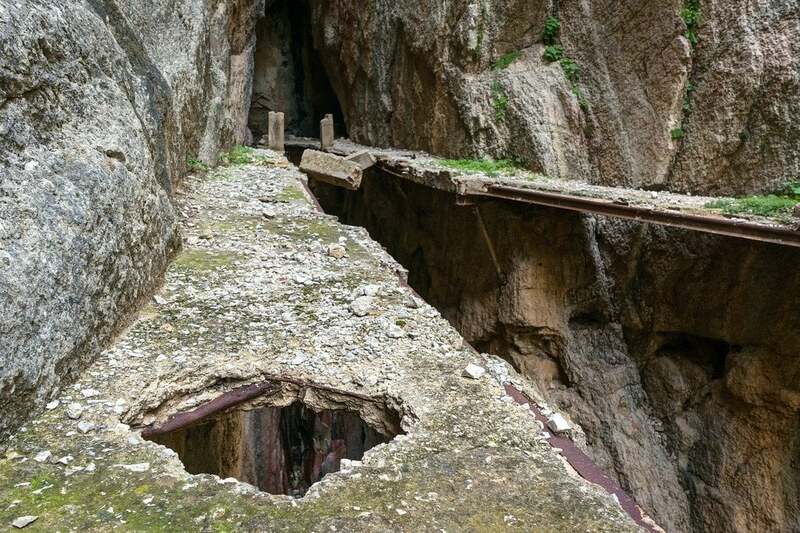 Sometimes whole sections of the treacherous walkway are completely missing after they’ve crashed down to the bottom of the canyon 100 meters (350 feet) below. If you’re afraid of heights, it’s the stuff of nightmares. Work just finished on a €3.12 million restoration program in 2015 that transformed the entire walkway into a much safer route, opening up the path to more people and regular tourism. The aging concrete was replaced with wooden slats and glass panels with a handrail. 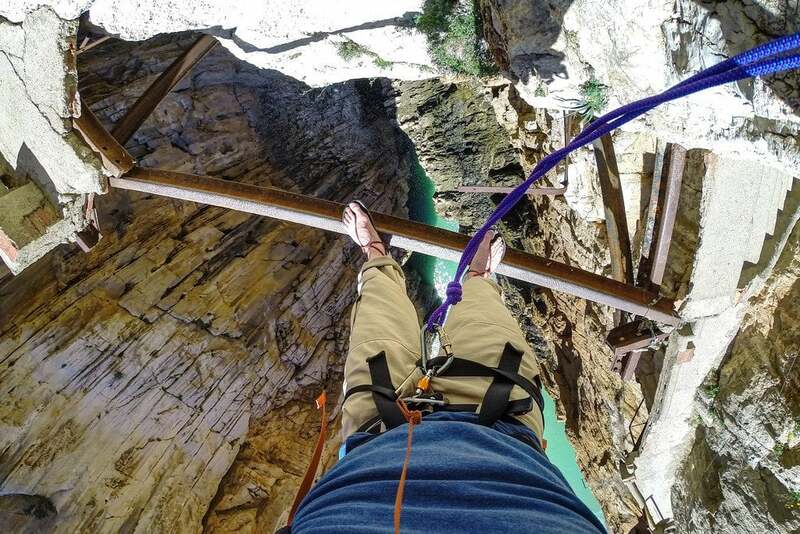 While more people will now get to enjoy the views of this magnificent canyon, sadly the adventurous spirit of the Camino has changed now that it’s fixed up. I’m very lucky I was able to hike it when I did! 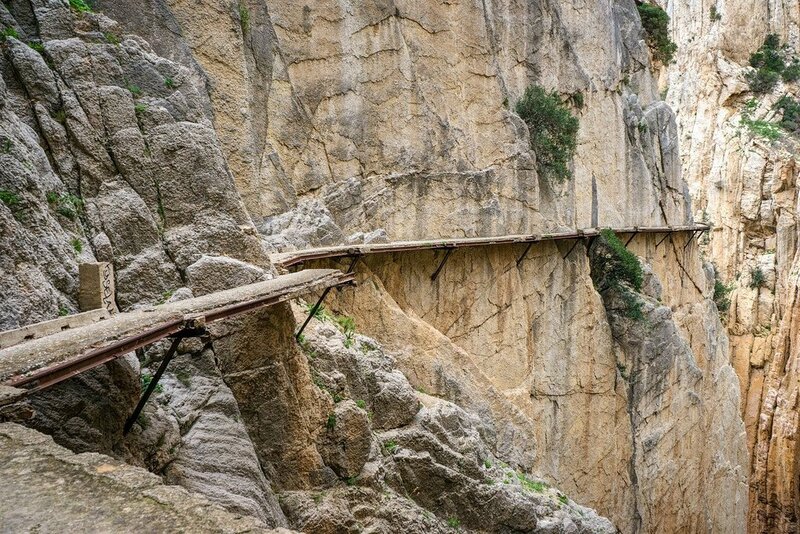 How do you feel about the Caminito del Rey getting fixed? Would you have hiked this route? Share your thoughts in the comments below!